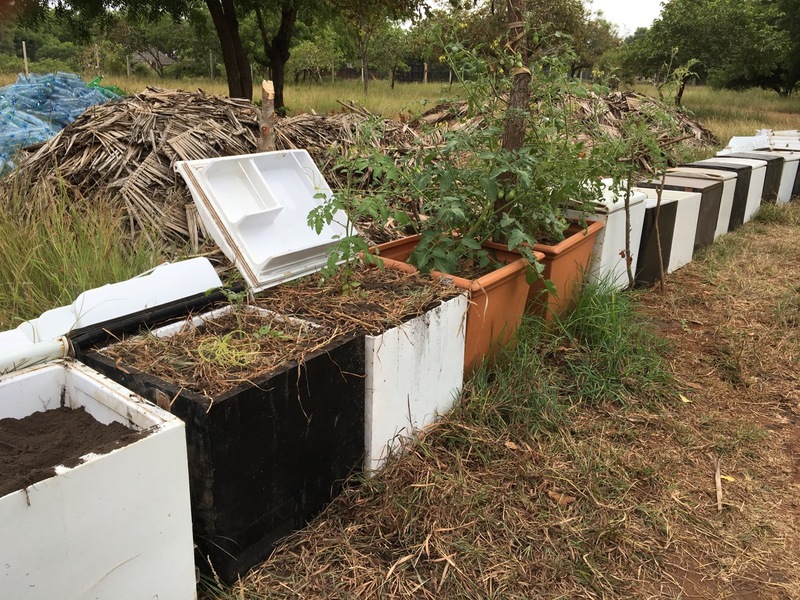 Since it first began, one of the ideas behind The Sands’ organic farm was to find ways in which large broken items that might be considered as 'waste' and thrown away can instead be re-used. Broken Jacuzzi Wormary and glass bottle growing beds- the beggining. Mini-bar fridges as growing boxes. Remember to compost and mulch regularly. To-date the farm has re-used over 30 minibars, 4 chest freezers, 3 drinks fridges, 2 Jaccuzis, multiple car tires, a tractor tire, hundreds of 5 to 10 litre plastic bottles and thousands of 1 litre plastic bottles (none of this plastic waste was produced by The Sands) as well as thousands of glass bottles from the restaurant, oh, and a Ghost-net which was removed from the corral reef by The Marine team from the Crab Diving Centre. The glass bottles from the restaurant are easy to re-use; some are taken by The Sands building crew to use as sustainable bricks for building, others have become outdoor decoration whilst yet more are collected and delivered to the farm where they are used to make raised beds for planting (very useful when trying to farm on shallow soil with lots of corral). Expanding the farm using glass bottles from this past high season. One of the best things about re-using glass or plastic 'waste' items is that by using them in their raw form, one does not expend much energy or money on dealing with one's 'waste'. Secondly, these items will always have a value in recycling, so by putting them somewhere we are using and also stock piling a material of value which may be used in the future. Useful storage!